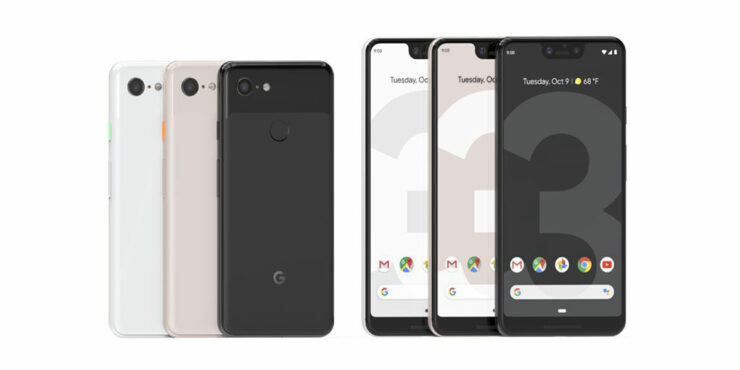 The wait is finally over; Google has officially announced the Pixel 3 and the Pixel 3 XL lineup and apart from that changed design that we’ve known about for weeks, there are several hardware changes added to both devices too. Of course, both smartphones are also going to be featuring the tech giant’s best-in-class software, which is stock Android, and both of them are also going to be running the latest operating system update from the firm; Android 9 Pie. Without wasting any more time, here are all the specifications, features, pricing, pre-order and availability details that you need to know about the Pixel 3 and the Pixel 3 XL. The Pixel 3 features a 5.5-inch screen while the display on the larger Pixel 3 XL measures 6.3 inches. The design difference can be seen vividly, as the bigger brother sports a notch and chin bezel while the Pixel 3 does not. However, the size difference also means that both devices will feature different battery capacities and will henceforth, provide a varied level of endurance, but that will also depend on your daily usage. Also, the squeeze feature makes a return to both smartphones, and it will end up summoning Google Assistant immediately. The Pixel 3 and the Pixel 3 XL are armed with a Snapdragon 845 paired with 4GB of RAM and 64GB of non-expandable storage (128GB for the higher storage variants). This is ‘business as usual’ for Google and the stock Android UI plus other optimizations should make sure that those internal specifications are sufficient to make either one of these devices your daily driver. Both premium devices now provide support for Qi wireless charging, because the omission of the 3.5mm headphone jack will need to be replaced with a more convenient addition. It should be noted that both devices support the fast wireless charging standard, which can provide up to 10 watts of power for both phones. However, you will need to purchase the Qi wireless charger separately. Google has also incorporated dual-front-firing speakers to improve the media consumption experience for future users. The latest family from Google sports a single 12MP sensor at the back, along with a dual-camera with an 8.1MP + 8.1MP setup. The ways that images are going to be processed have been greatly improved according to the company, and it also introduces new features such as the AI ‘Top Shot’, along with ‘Photobooth’ and the Super res zoom. The big feature here is Top Shot and what it does it that it allows the camera to snap a bunch of pictures and then uses AI to select and combine the images into one where all the people have their eyes open and are smiling. Google Lens is also now embedded in the camera and many features work even when you are offline. The dual-camera setup at the back will help to snap regular selfies, and the secondary camera can help to shooter group selfies if you are running out of space on the viewfinder. Portrait Mode has now been improved and better, and you can now select the level of background blur after you take the shot. You can also switch the focus of an image to something different and make the color of your subject pop. Owning a Pixel 3 will also mean that you will get unlimited storage for photos. There is a 2,915mAh battery present in the Pixel 3, while a larger 3,430mAh cell is found inside the Pixel 3 XL. Both high-end smartphones are going to be receiving power through a Type-C USB port, and there is also a USB PD charger that is bundled with both handsets, along with a USB-C to USB-C cable. The Pixel 3 and the Pixel 3 XL are also going to be running Android 9 Pie right off the bat, with Google providing timely security and software updates for both of them in the future. Google is not laying its finger off the expensive price trigger, so the Pixel 3 and Pixel 3 XL and not going to be coming cheap. The base model of the smaller smartphone costs a whopping $799, while the Pixel 3 XL will set you back by $899. Both devices are going to be available at Google’s online store and Verizon Wireless, with the company stating that YouTube Music comes with free for 6 months. The available colors will be Just Black, Clearly White, and Not Pink, and pre-orders of both handsets will commence as soon as the event is over. The packaging of both phones includes a pair of Type-C USB earbuds and a single Type-C digital 3.5mm headphone adapter. As for the release date, according to the Google Store, both devices are going to be shipped on October 17.